The next advance in Wi-Fi, 802.11ax, is fast approaching. As we seek to raise the performance bar yet again for the sixth generation of Wi-Fi, the traditional techniques used in 802.11n and 802.11ac – wider RF channels, more MIMO antennas, higher QAM modulation – have been pushed almost to the limit, and it’s time to look for new ideas. 802.11ax introduces techniques for ‘massive parallelism,’ especially OFDMA, multi-user MIMO, and ‘BSS coloring.’ All of these require the access point to make control decisions that have a significant effect on network performance, a new emphasis for Wi-Fi that will move access point networks closer to cellular base station infrastructure in terms of functionality. We have already covered the topic of OFDMA in my previous blog but let’s review it again. OFDMA (Orthogonal Frequency Division Multiple Access) allows a single transmission to or from the AP to include data to or from multiple clients. For the downlink, the access point uses groups of sub-carriers within the RF channel simultaneously, whereas previously it would have sent the data in a sequential series of packets, taking the whole RF channel bandwidth. In the uplink direction, several clients transmit simultaneously, their signals reaching the access point on different sub-carriers, so they can be received in parallel. 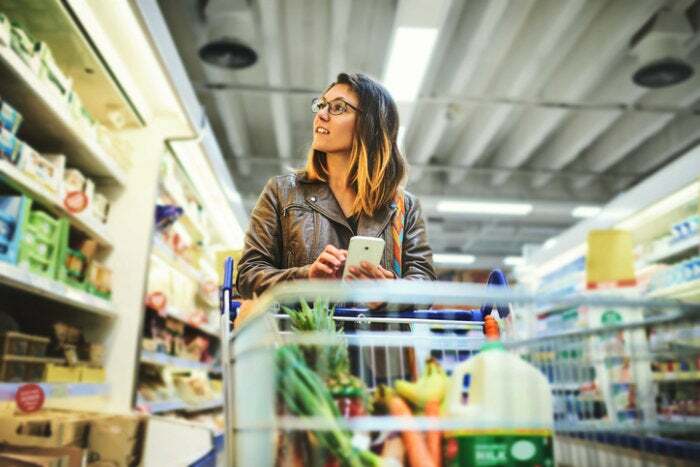 Reduced header and contention overhead improve efficiency, and small-packet throughput is significantly better, but the real magic of OFDMA lies in powerful control over individual transmissions. Wi-Fi transmission is a complex interaction between many parameters including transmit bit rate, transmit power, receive sensitivity and noise levels, channel bandwidth, and more. OFDMA offers opportunities to optimize these parameters for each transmission and each client, then group them in different combinations for optimum efficiency and performance. First, the access point can choose which packets to transmit immediately, and which are not so time-sensitive and can be sent later (this is only necessary when the network traffic approaches capacity). With 802.11ax, it can look into its packet buffer and choose groups of packets for each transmission – for instance, it might choose to group many short packets into a single transmission, using many small sub-channels, while longer packets could get a transmission opportunity to themselves, taking the whole channel bandwidth. The access point also chooses what bit-rate to use for each transmission, per client. It can use a high bit-rate for the shortest transmission time, or drop the rate a little to reduce the probability of errors and re-transmissions, which may under some circumstances be a more efficient choice. To take an example, it may decide that 256-QAM with an error rate of 2% is a better choice than 1024-QAM with an error rate of 15%. In addition to error and retransmission rates, OFDMA allows the access point to control latency and jitter. A client generating small packets at frequent intervals would, before 802.11ax, have to contend for a transmit opportunity for each packet. If there were other clients in the network sending long packets, it would also have to delay transmissions, causing buffering of packets and jitter. With 802.11ax, the access point can assign frequent, short transmission opportunities so it can transmit and receive packets without the need to buffer them. To take an example, a traditional voice-over-IP connection generates a ~160 byte packet every 20msec, so the access point can ensure it schedules periodic transmit opportunities for such traffic. In 802.11ax OFDMA, the access point assigns client traffic to sub-channels, not just for the downlink but also for the uplink. The new ‘trigger frame’ mechanism allows the access point to poll clients to discover what traffic they wish to send on the uplink. When it collects the trigger frame responses, it designs a schedule and sends it to clients in another trigger frame. Clients then construct frames according to their instructions, setting data rates, transmit levels and sub-channels, and transmit data frames back to the access point. The other multi-user mechanism in 802.11ax is multi-user MIMO. This uses the same trigger-frame control protocol as OFDMA, improving on 802.11ac. Multi-user MIMO is itself a complex protocol, requiring sounding packets to determine multipath conditions and group MIMO clients, all under the control of the access point. At any moment, the access point can choose to use traditional single-user transmissions, or multi-user, with OFDMA or MIMO. This opens new dimensions in traffic management. For example, latency and jitter can be tightly controlled. Previously, clients had to contend for a transmit opportunity, with relatively unknown and uncontrollable delays that could be bounded but not precisely defined by the WMM (Wireless Multi-Media) QoS priority mechanism. With 802.11ax multi-user control, a delay-sensitive traffic stream can be given frequent, predictable transmission slots for precise control of jitter and latency. And since OFDMA gives the access point control over modulation rates and transmit power on both uplink and downlink, it has enough control to define the QoS parameters of each traffic stream. In fact, it’s possible for an 802.11ax access point to impose a TDM-like (time division multiplexing) structure on communications with its clients, where it controls the timing and parameters of each transmission, uplink and downlink. Where traffic patterns are known and change slowly, this is the most efficient regime for spectral efficiency: the amount of data carried in a given RF channel width. For large packets such as large file transfers MU-MIMO is more efficient whereas for shorter packets like IM or emails OFDMA would be a better option to use. 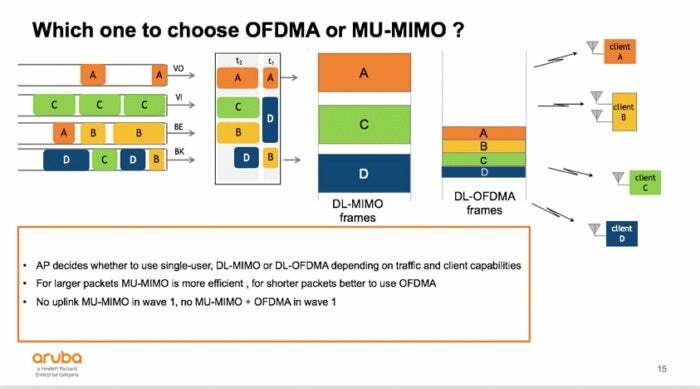 The decision on which mode to use – single-user, OFDMA, or MU-MIMO – rests with the access point. Yet another area where access point control becomes more powerful in 802.11ax is where many access points, centrally managed or separate, participate in ‘spatial re-use,’ often known as ‘BSS coloring.’ We will cover this important feature in depth in a future blog. 802.11ax introduces several new functions where the access point can control network behavior, with opportunities for access point vendors to add sophistication and improve performance. The control of multi-user traffic, both uplink and downlink, along with the new OFDMA feature and enhancements to multi-user MIMO, offer more opportunities for deterministic QoS. At the same time, spatial re-use, a potentially powerful feature, will be dependent for its performance on how access points decide to apply color tags. As 802.11ax rolls out, expect to hear access point vendors extolling the power of their scheduling algorithms and traffic control features. Ready to Learn More About 802.11ax? Get an in-depth understanding of 802.11ax in this whitepaper.